For all Intermediate Microeconomics courses at the undergraduate or graduate level. 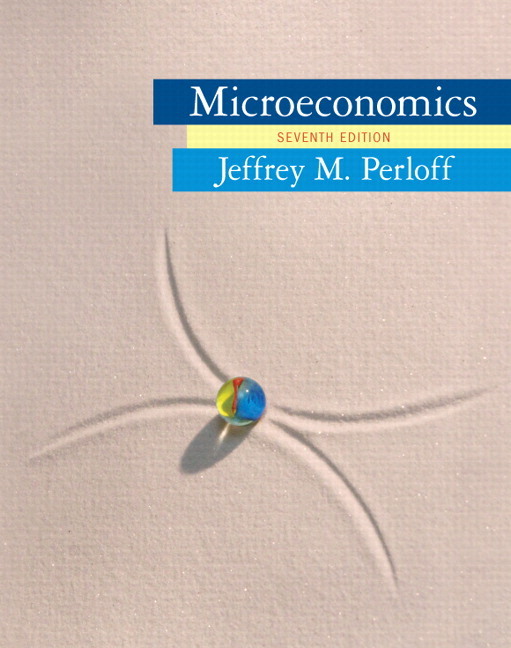 A market-leading text, Microeconomics presents economic theory in the context of real, data­-driven examples, and then develops students’ intuition through hallmark Solved Problems. The text places emphasis on modern theories--such as industrial organization theory, game theory, and transaction cost theory--that are useful in analyzing actual markets, while a step-by-step problem-based learning approach demonstrates how to use microeconomic theory to solve business problems and analyze policy. The 8th Edition has been substantially updated with new or revised real-world examples, applications, and problems so that students gain a practical perspective, seeing how models connect to real-­world decisions being made in today’s firms and policy debates. NEW! Math Review Exercises. MyLab Economics now offers a rich array of assignable and auto-graded exercises covering fundamental math concepts geared specifically to principles and intermediate economics students. Aimed at increasing student confidence and success, our new math skills review Chapter R is accessible from the assignment manager and contains over 150 graphing, algebra, and calculus exercises for homework, quiz, and test use. Offering economics students warm-up math assignments, math remediation, or math exercises as part of any content assignment has never been easier! Question Help. MyLab Economics homework and practice questions are correlated to the textbook, they generate algorithmically to give students unlimited opportunity for practice and mastery, and they offer helpful feedback when students enter incorrect answers. Questions include guided solutions and other multimedia assets for extra help at point-of-use. Videos. Key figures and concepts from the textbook are presented in step-by-step animations with audio explanations of the action. These new videos are embedded in the eText and accessible through MyLab Economics. Practice. Algorithmically generated homework and study plan exercises with instant feedback ensure varied and productive practice that help students improve their understanding and prepare for quizzes and tests. Many exercises require the student to draw figures or solve mathematical problems. Concept Checks. Concept Checks at the end of each section act as “speed bumps” that encourage students to stop and check their understanding of fundamental terms and concepts before moving on to the next section. Consisting of a few multiple-choice, true/false, or fill-in-the-blank questions, they help students assess their progress on a section-by-section basis, so they can better prepare for homework, quizzes, and exams. UPDATED! Animated Graphs in MyLab Economics accompany many of the key graphs and figures in the text, and have been updated with real-time data from FRED™ (Federal Reserve Economic Data)--a comprehensive, up-to-date data set maintained by the Federal Reserve Bank of St. Louis. Students can display a pop-up graph that shows new data plotted in the graph, to better understand how to work with data and understand how including new data affects graphs. More dynamic than graphs on a printed page, these animated ones help students understand shifts in curves, movements along curves, and changes in equilibrium values. Current News Exercises. Every week, Pearson scours the news, finds a current article appropriate for a microeconomics course and adds a gradable exercise based on it to MyLab Economics. Experiments. Flexible, easy to assign, auto-graded, and available in Single and Multiplayer versions, the Experiments in MyLab Economics make learning fun and engaging. Interactive Solved Problems. Each of the Solved Problems in the text is accompanied by a similar problem in MyLab Economics, so students can practice and build their problem-solving skills. These interactive tutorials help students learn to think like economists and apply basic problem-solving skills to homework, quizzes, and exams. The goal is for students to build skills they can use to analyze real-world economic issues they hear and read about in the news. The Enhanced eText keeps students engaged in learning on their own time, while helping them achieve greater conceptual understanding of course material. The worked examples, animations, and interactive tutorials bring learning to life, and algorithmic practice allows students to apply the very concepts they are reading about. Combining resources that illuminate content with accessible self-assessment, MyLab Economics with Enhanced eText provides students with a complete digital learning experience--all in one place. Personalized Learning. Not every student learns the same way or at the same rate. With the growing need for acceleration through many courses, it's more important than ever to meet students where they learn. Personalized learning in MyLab Economics gives you the flexibility to incorporate the approach that best suits your course and students. The Study Plan acts as a tutor, providing personalized recommendations for each of your students based on his or her ability to master the learning objectives in your course. This allows students to focus their study time by pinpointing the precise areas they need to review, and allowing them to use customized practice and learning aids–such as videos, eText, tutorials, and more--to get them back on track. Using the report available in the Gradebook, you can then tailor course lectures to prioritize the content where students need the most support--offering you better insight into classroom and individual performance. Dynamic Study Modules help students study effectively on their own by continuously assessing their activity and performance in real time. Here's how it works: students complete a set of questions with a unique answer format that also asks them to indicate their confidence level. Questions repeat until the student can answer them all correctly and confidently. Once completed, Dynamic Study Modules explain the concept using materials from the text. These are available as graded assignments prior to class, and accessible on smartphones, tablets, and computers. NEW! Instructors can now remove questions from Dynamic Study Modules to better fit their course. Available for select titles. Reporting Dashboard. View, analyze, and report learning outcomes clearly and easily, and get the information you need to keep your students on track throughout the course, with the new Reporting Dashboard. Available via the MyLab Economics Gradebook and fully mobile-ready, the Reporting Dashboard presents student performance data at the class, section, and program levels in an accessible, visual manner. Mobile Ready. Students and instructors can access multimedia resources and complete assessments from any mobile device. Learning Management System (LMS) Integration. You can now link from Blackboard Learn, Brightspace by D2L, Canvas, or Moodle to MyLab Economics. Access assignments, rosters, and resources, and synchronize grades with your LMS Gradebook. For students, single sign-on provides access to all the personalized learning resources that make studying more efficient and effective. Optional Calculus-based Questions and Problems. For well-rounded practice, a suite of carefully crafted calculus-based problem sets is provided. NEW! Challenges. Each chapter begins with a Challenge that presents information about an important, current real­-world issue and concludes with a series of questions about that material. All of the Challenges and almost all of the examples and Applications throughout the book are updated or new. NEW! and UPDATED! Solved Problems. In each chapter, Solved Problems provide students with a step-­by-­step model for working out both qualitative and quantitative problems. With this edition, every Solved Problem has at least one associated Question at the end of the chapter. NEW! and UPDATED! 133 Applications covering events in 2015 and 2016, historical events, and timeless material. To make room for the new Applications, older ones from the 7th Edition were moved to MyLab™ Economics, along with several new ones. NEW! and UPDATED! End­-of-­chapter Questions draw from real-life events and issues from newspapers, journal articles, and other sources, to test students’ understanding. Balanced coverage of both Traditional and Modern Theories. Core microeconomic theories--consumer theory, theory of the firm, and perfect competition--are covered thoroughly in the first half of the book, followed by a fully up-­to-­date, authoritative treatment of modern theories–such as game theory, strategies, uncertainty, and moral hazard. Real-­World Examples and Applications. Hundreds of examples and applications use real people, real companies, and real data to illustrate microeconomic theory. 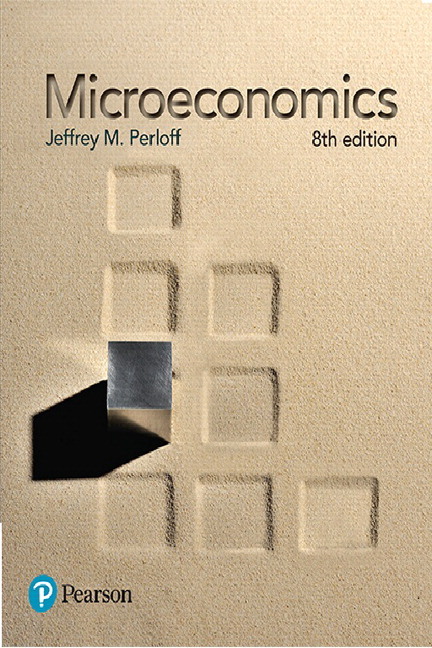 Valuable, practical perspective, abundant examples, and applications showcase the versatility of modern microeconomics. 5 Cross-­Chapter Analyses throughout the text create crucial links between core theories covered in separate chapters, combining Applications with Solved Problems to give students hands­-on practice designed to sharpen their analytical and quantitative skills. What­-If Policy Analysis. Economic models are used to probe the likely outcomes of changes in public policies such as taxes, subsidies, barriers to entry, price floors and ceilings, quotas and tariffs, zoning, laws limiting diversification, pollution controls, licensing laws, and laws governing pensions. Chapters 2 and 3 illustrate basic theory using empirical estimates from avocado, coffee, corn, ethanol, and oil markets. They’ve been substantially rewritten and the major coffee example is new to this edition. Three Solved Problems have also been significantly revised. Chapters 4 and 5 are reorganized and significantly revised, particularly Cost-of-Living-Adjustments. Chapter 6 has a substantially modified section, Production, and light revisions elsewhere throughout the text. Chapter 7 has been moderately revised, particularly the material associated with Figure 7.2. Chapter 8 has been substantially revised, particularly the beginning of Two Steps to Maximizing Profit, discussion of the shutdown decision, Competition in the Short Run, Entry and Exit, Long-Run Market Supply When Input Prices Vary with Output, as well as several figures. Chapter 9 has been substantially rewritten, particularly the introduction, the section on Policies that Shift Supply Curves, and discussion of oil trade, which uses a new estimated model. In this chapter and following chapters, deadweight loss is consistently expressed as a negative number. Chapter 10 features a rewritten Solved Problem, a comparison of Pareto superiority, and material on Efficiency and Equity. Chapter 11 has two new Solved Problems, and all of the material on Apple has been revised. Chapter 12 has been moderately revised–the group discrimination material has been reorganized and significantly revised, the two-part pricing material has been lightly revised, and it contains a new Solved Problem. Chapter 13 has been significantly revised: Cartels, Cournot Oligopoly and Comparison of Competitive, Stackelberg, Cournot, and Collusive Equilibria have all been rewritten. Chapter 14 has two new Solved Problems, the static game section has been completely reorganized and rewritten, the dynamic game section has been significantly revised, and new discussion of double auctions has been added. Chapter 15 has a modified Table 15.1, Figures 15.9 and 15.10, and discussion of monopsony has been included. Chapter 16 has two rewritten Solved Problems and many facts have been updated. Chapter 17 has a rewritten discussion of framing, a significantly modified Solved Problem, a new introduction to the section on Reducing Risk, and a new subsection Just Say No. Chapter 18 has substantially revised sections on the Coase Theorem, club goods, and public goods. Chapter 19 has been moderately rewritten and has a substantially revised Solved Problem. Chapter 20 has a new Challenge Solution. Math Review Exercises. MyLab Economics now offers a rich array of assignable and auto-graded exercises covering fundamental math concepts geared specifically to principles and intermediate economics students. Aimed at increasing student confidence and success, our new math skills review Chapter R is accessible from the assignment manager and contains over 150 graphing, algebra, and calculus exercises for homework, quiz, and test use. Offering economics students warm-up math assignments, math remediation, or math exercises as part of any content assignment has never been easier! Animated Graphs in MyLab Economics accompany many of the key graphs and figures in the text, and have been updated with real-time data from FRED (Federal Reserve Economic Data)–a comprehensive, up-to-date data set maintained by the Federal Reserve Bank of St. Louis. Students can display a pop-up graph that shows new data plotted in the graph, to better understand how to work with data and understand how including new data affects graphs. More dynamic than graphs on a printed page, these animated ones help students understand shifts in curves, movements along curves, and changes in equilibrium values. Challenges. Each chapter begins with a Challenge that presents information about an important, current real­-world issue and concludes with a series of questions about that material. All of the Challenges and almost all of the examples and Applications throughout the book are updated or new. Solved Problems. In each chapter, Solved Problems provide students with a step-­by-­step model for working out both qualitative and quantitative problems. With this edition, every Solved Problem has at least one associated Question at the end of the chapter. 133 Applications covering events in 2015 and 2016, historical events, and timeless material. To make room for the new Applications, older ones from the 7th Edition were moved to MyLab™ Economics, along with several new ones. End­-of-­chapter Questions draw from real-life events and issues from newspapers, journal articles, and other sources, to test students’ understanding.